This weekend delivered the most beautiful weather to the coast. 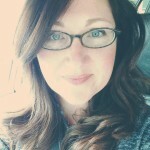 Not just one day, either… but 3 glorious days of much needed sunshine. Lawn mowers hummed, neighbors chatted in their yards; with a collective sigh, we cleared out the cobwebs of winter and ventured outside. Our street looked like a tv ad for Home Depot. IZ and I spent the better part of the weekend, like our neighbors, reclaiming our yard and porch. In our case, there was such a huge build-up of construction debris on the porch, we decided to empty it and give it a good scrub down. Hours of elbow grease later it’s gleaming out there. “If you squint your eyes, it looks like we just painted!” (if you don’t look down at the floor) Or so my industrious husband would have me believe. The porch truly is beautiful, even with the chippy paint. We had our first out-door brunch of the season (which we were too busy eating to even think about photographing) and we got so excited about the lovely weather we even put up the bunting early. We also did a little gardening. In my case, clearing out the shade bed and replanting the holes that didn’t make it through this very weird winter. 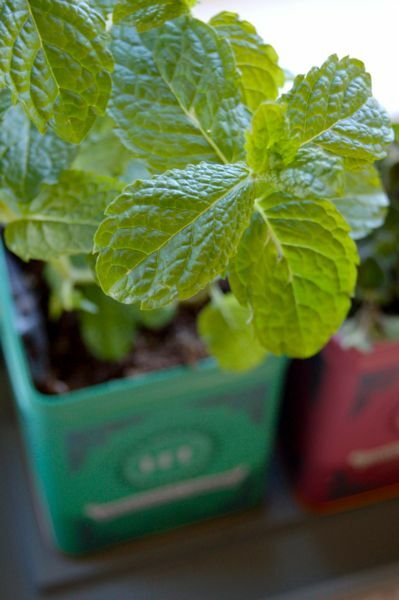 And I planted this adorable Herb Garden in Tea Tins. I’ve been meaning to do this for ages with all my left over Harney’s tins. I have lots of them, since I’m such a huge fanatic and it’s hard to throw them away, they’re so pretty. An herb garden seemed like a great use for a few of them. I’ve posted the short tutorial below the fold; it’s super easy to do and bonus, you get to use a power tool! I think the little garden turned out beautifully. The perfect project for Earth Day. Directions under the jump! 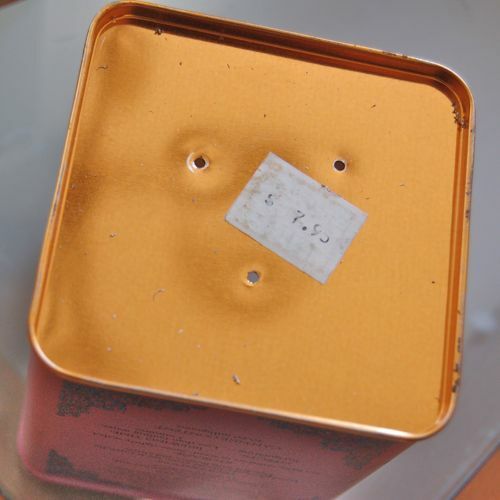 First, drill holes in the bottom of your tea tin. Yay, power tools. Next, you’ll want to line your tea tin with a zip lock bag. Tuck the bottom into the corners and mark where you need to cut off the top. Go ahead and cut off the top of the plastic bag just to the edge of the tin. 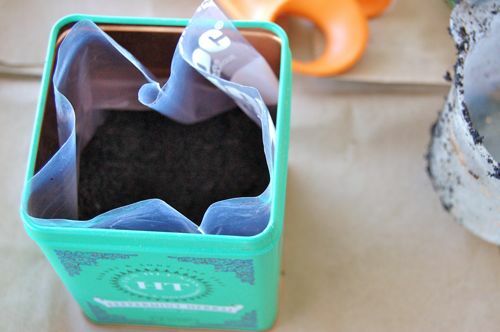 Then fill the bottom of the tin with potting soil. You’ll need to eyeball your plants to make sure you put in enough potting soil to get your plant to fit properly. Finally, insert your chosen plant. 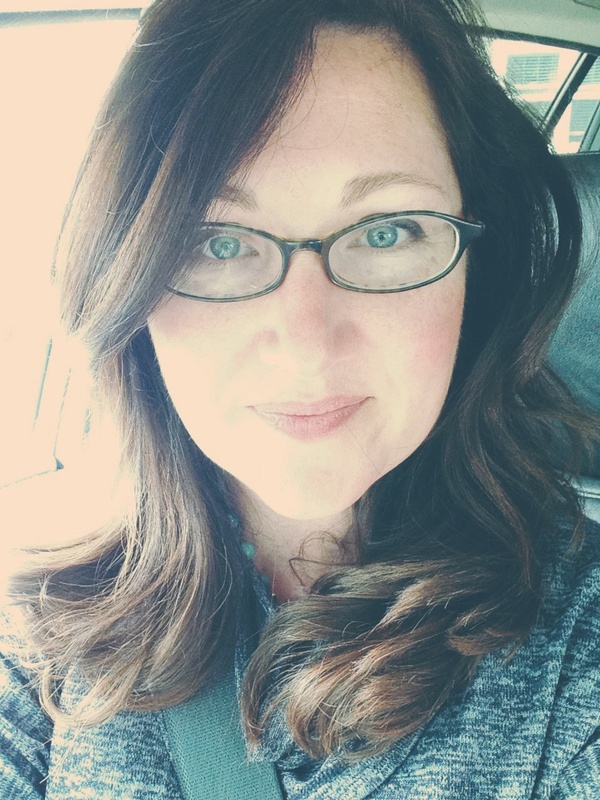 I don’t have a photo of that—too hard to photograph myself in action. Once you’ve potted your plant, use a sharp pointy object (I used a stainless steal kabob skewer) and poke holes in the plastic bag on the bottom through the drain holes you drilled previously. The soil will hold down the plastic so that your holes line up and your plant can drain properly. 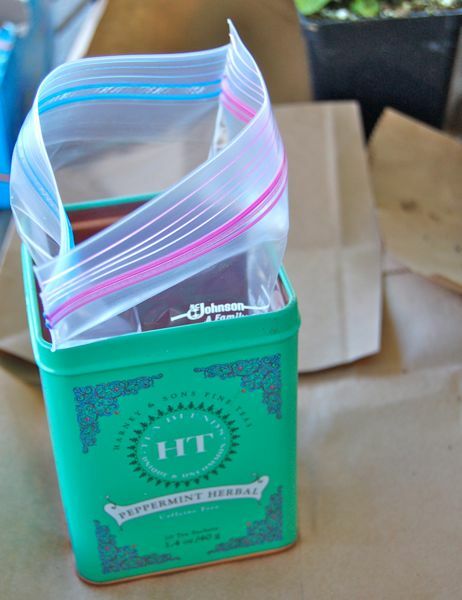 The plastic will help prevent your tea tin from rusting too quickly. 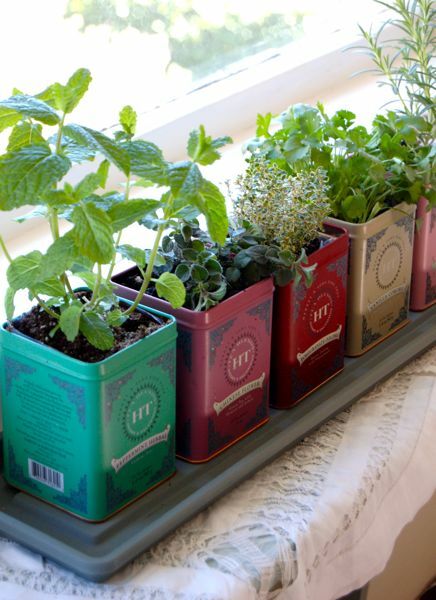 Finally, you’ll want to place your tins in a sunny window and make sure they have some sort of water tray beneath them. I found this plastic tray at Home Depot for $4 and it holds 5 tins perfectly. 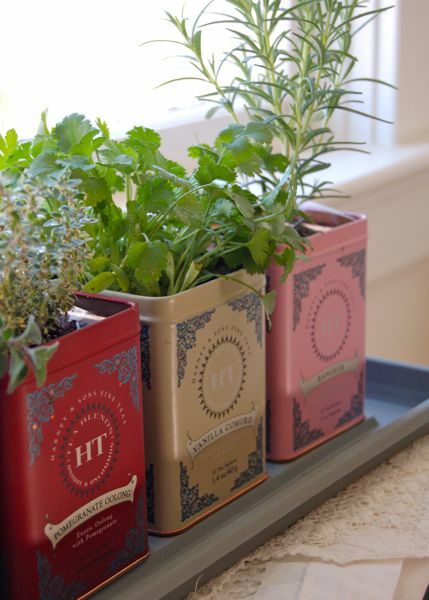 I love those tin herb pots! I don’t know how you manage to get anything done with that porch. I’d be sitting there eating my beetless puff pastry cheddar apple tart and reading all day long. Well, the weather plays a part in the lounging impulse. If it were warm and sunny more, I’d get less done. 😀 But lovely weather is rare, so you use it when it comes. And then when it’s blustery out, it’s not really inviting to sit in the cold and wind. As for the pastry, you’re not the only one who isn’t thrilled about the beets. On a those rare balmy days, it does feel resort like. I love our views! That is very clever! Every time I try window herb gardens, it’s the long planter kind which looks terrible when I kill off the first plant and just plain sad when I kill the second. This way, I could switch out the suddenly brown or empty ones and leave no evidence while I try again. 🙂 great tutorial, too. That’s a very good point, Carly! I hadn’t thought of that, but you’re so right! My problem is usually “kitty slug” OY!! Hoping she leaves these herbs alone… of if she doesn’t, she finds the spicy oregano first and learns her lesson! 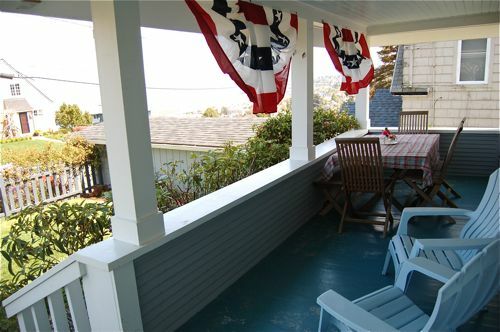 Oh my, your porch is simply beautiful…and what gorgeous views! this is such a great idea! have a bunch of gorgeous chinese tea tins that i just couldn’t bear to throw away, fresh herbs is such a great way to repurpose these!! recently tried this out in my apartment so i could grow fresh herbs in my kitchen window. drilled plenty of holes in them (more like 8-10 each), put organic soil right into the tins. but unfortunately, mine don’t seem to be draining properly. was it a mistake that i didn’t use the zip-lock bags as liners? if so, do i need to drill holes in the bags, or just in the tins? or do you think it was because i drilled from the outside of the tins in (as opposed to inside out)? any suggestions/advice would be much appreciated. want to fix the issue before I kill off all of my beautiful little herb plants. thanks!!! You know, I’m not sure what the issue is. I do poke holes in my plastic bags, after I’ve filled the tin with soil. That way the holes line up!